Hornets rack up fifty percent o f this week’s awards. BIRMINGHAM, Ala. – Alabama A&M redshirt junior quarterback Damion May, junior linebacker Trae Ferrell, freshman punter/kicker Hunter Hanson and Alabama State redshirt freshman Darryl Pearson were all named the Southwestern Athletic Conference Football Players of the Week for their outstanding play in week seven. May completed 10-of-13 passing for 168 yards with two touchdowns (47 yards and 12 yards) with no interceptions. The redshirt junior also rushed for 47 yards on nine carries and scored on a pair of touchdown runs of seven yards and eight yards in leading the Bulldogs to a 49-14 victory against Mississippi Valley State. Ferrell tallied a sack, two tackles for a loss, a forced fumble and a fumble recovery. 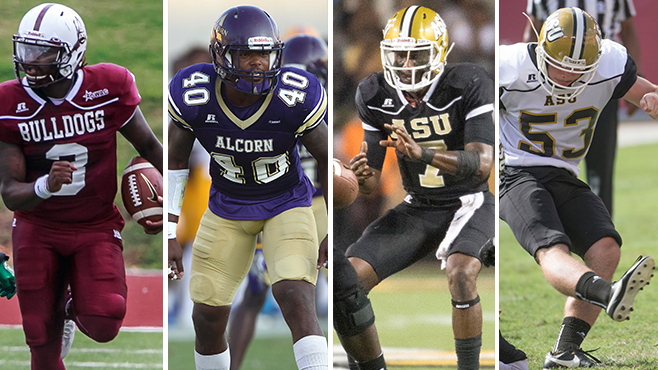 He led Alcorn’s defense in its 34-21 victory over Prairie View A&M on homecoming. His forced fumble and fumble recovery came on a strip-sack on fourth down for PVAMU in the fourth quarter. Ferrell returned the fumble 49 yards. It was his third fumble recovery of the season which is among the nation’s leaders. Hanson had his best day as a collegiate kicker Saturday against Texas Southern, scoring 11 points for the Hornets. The freshman connected on a trio of field goals and a pair of extra points in the victory. He connected on field goals of 35, 28 and 40 yards – with the latter being a career long. The freshman connected on a 35- yard field goal on the opening drive to give Alabama State a 3-0 lead, before hitting a 28-yard field goal in the third quarter to trim the lead to 16-10. He hit his final field goal, a 40-yarder that extended the lead to seven with 4:14 remaining in the contest. Pearson came off the bench late in the first half, with the Hornets trailing 16-3 and led them to a 23-16 road victory over Texas Southern on homecoming. The redshirt freshman finished 9-for-11 for 126 yards passing and a pair of touchdowns. He also ran the ball four times for 19 yards. Pearson led the Hornets on four scoring drives upon entering the game and connected on touchdown passes of eight yards to Palmer Graham and 67- yards to Willis White – the latter giving the Hornets the lead for good at the end of the third quarter.